O besity is considered a major health crisis in the United States and many other countries. According to the Food Research and Action Center, “Obesity rates have more than doubled” since the 1970s. It has also been reported that two-thirds of Americans are considered overweight or obese. While media pundits and nutritional scientists speculate the cause of obesity, one source of the problem seems apparent: junk food. If you called the series horrific, he might not mind. Using junk food, he produced some of the most disturbing images you can imagine. Monsters. At an early age, James Ostrer’s parents divorced. It was a troubling time for him and his parents did what they could to lift their child’s spirits. His father, in particular, thought Happy Meal’s would work. Therefore, whenever Ostrer’s father picked him up for the week, he started things off with a trip to McDonald’s. Unfortunately, instead of lifting Ostrer’s mood, this tradition brought on a bad habit. Ostrer began turning to junk food as a way to cope with stress. As he got older, Ostrer noticed his health was in decline. This got him thinking about how his relationship with junk food negatively impacted his life. He also began to reflect on how junk food impacts the world. That was when inspiration struck. 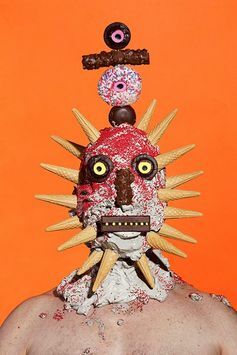 The result was a series of portraits that showcased grotesque monsters made entirely of junk foods like candy, burgers, and chocolate. 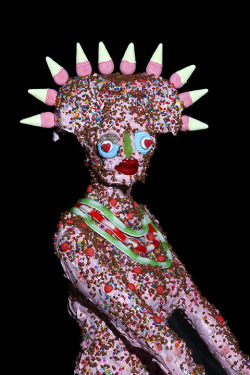 Ostrer used junk food as material to completely cover his models from head to toe. After eight hours in the “makeup” chair, each monster emerged looking horrifying and disturbing. This was Ostrer’s goal. The photographer successfully made the point that our relationship with junk food is indeed horrifying, grotesque, and disturbing. Ostrer also titles his photographs to enrich his message. Each one contains the letters, “EF,” followed by a number. “EF” stands for “emotional fossil.” This structure mirrors what is called “E numbers.” The Food Standards Agency’s code for what are considered safe additives. The reviews are strict but somehow, fast food restaurants keep managing to receive passing grades. By viewing Ostrer’s photographs, we are invited into his perspective; a perspective that he hopes will alter the trends of junk food. This entry was posted in Food, Food as art, Obesity, Photographer, photography, United States and tagged Food, health crisis, James Ostrer, junk food, junk food art, obesity, Outsider Art, photographer, Photography, United States on October 7, 2014 by segmation. Wow, thank you SO much for the introduction to this artist! What fascinating work! I have my own junk food issues. And even though I’m an artist, I hadn’t thought about addressing it creatively. I’ve been gone from the blogosphere for a while, as we’ve been moving and were without wifi until a few days ago. This was a fascinating piece to read upon my return.